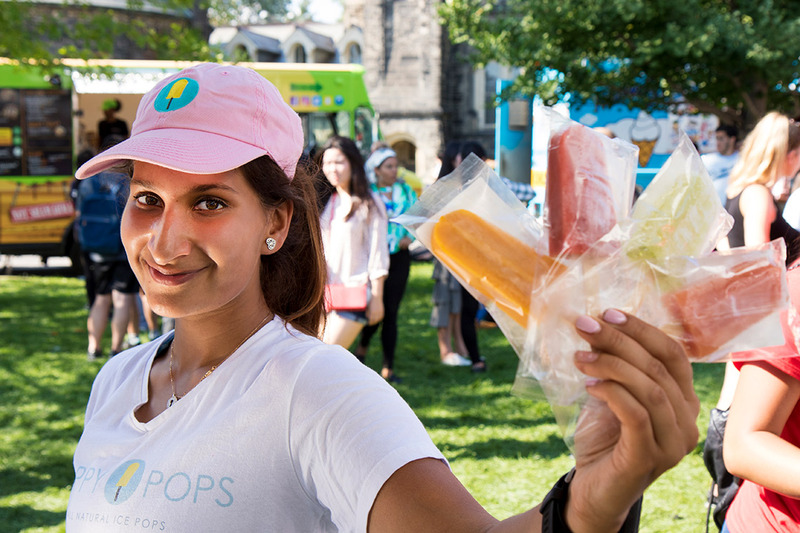 Leila Keshavjee sometimes feels like the odd woman out among tech-minded University of Toronto entrepreneurs – she makes ice pops – but that didn’t stop her from landing a deal on the hit CBC show Dragons' Den. On last night's season première, Keshavjee agreed to a $150,000 investment from Arlene Dickinson in exchange for 30 per cent of her startup Happy Pops, which makes all-natural ice pops in flavours ranging from guava to pineapple coconut. “I think the days of red, white and blue popsicles are done,” says Keshavjee, who graduated with a bachelor’s degree in kinesiology from U of T two years ago and spoke to U of T News before yesterday’s episode aired. A long-time fan of the TV show, Keshavjee says she originally planned to be a doctor, but switched tracks in early 2016 when she came across a local ice pop business for sale. Drawing on her kinesiology background, she figured she could make an impact by developing a frozen treat that was reasonably healthy, tasted good and could be enjoyed year-round. Plus, it was a concept she had previously toyed with as a student. “I would always make smoothies at home, freeze them and take them with me to class,” she says. The ice pop catering business Keshavjee purchased was relatively small, with a 1,000-square-foot commercial kitchen, and zero retail products. Describing herself as a “go-big-or-go-home type of person,” Keshavjee set about creating an all-new ice pop portfolio – and brand – from scratch. So what makes Happy Pops unique? “It’s real fruit, very little organic sugar and very little water,” Keshavjee says. “Our flavours are bold and they’re not as icy as other artisanal popsicles out there. And not just any mango. Keshavjee says Happy Pop’s mangos are imported from India, where many believe the best-tasting mangos are grown. In general, she says she drew on her travels and South Asian heritage to find flavours that would be more appealing to Canada’s diverse population than the neon-coloured varieties typically found in supermarket freezers. Of course, creating a tasty ice pop is one thing. Convincing people to buy it is another. Keshavjee spent the past few years “hustling hard” as she attempted to build Happy Pops' brand. That included everything from catering at charity events to delivering popsicles to a gym down the street. Keshavjee even purchased a gourmet ice cream sandwich company to broaden out the product line. Keshavjee's drive and determination seemed to resonate with the Dragons. They were also impressed with her product and packaging. Keshavjee credits her family's background in the food manufacturing business – her father is a private label juice maker – for helping her spot an opportunity in a highly competitive sector. She also praises U of T’s Impact Centre accelerator, one of nine entrepreneurship hubs on campus, for helping her build her business. Keshavjee's support network was on full display at a screening party held last night at U of T’s Innis College. Keshavjee says 200 people turned out to watch her Dragons' Den appearance, including Impact Centre staff, friends and customers, among others. Even so, Keshavjee says it still felt strange being the lone ice pop operation amid dozens of U of T health, artificial intelligence and sustainable technology startups. The fish-out-of-water feeling continued when she first auditioned for Dragons' Den, one of the few pitch competitions she has entered. In the end, it hardly mattered. Keshavjee's insecurities seemed to melt away when she rode her bicycle-powered ice pop cart onto the stage.